Despite Intel currently having "one up" on AMD, they certainly haven't been resting on their laurels. Rather than just simply taking the QX6850, slapping an extra 4mb cache on top and calling it a new processor, Intel has given the chip a complete overhaul; replacing the aging polysilicon material used in most processors with their own "high-K" technology. 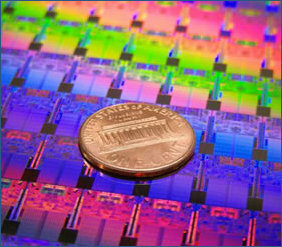 This combined with moving to the 45nm manufacture process has left us with a processor that consumes less power than its predecessors and paves the path for greater bumps in performance in the future. Coming from the "Extreme" lineup, the QX9650 is also an amazing overclocker. Even on fairly budget air cooling, we were able to take the chip all the way up to 4275mhz by utilizing a 9.5x multiplier along with a 450mhz FSB. This certainly wasn't the limit of the chip either, with heat being the only obstacle in our way. Users of water cooling or even more extreme methods of cooling should easily see 4.4ghz and beyond. We could at this point talk about the eye watering £640 price tag that the chip carries. But let's face it: everybody knows that Intel's top-end chips carry a premium price tag and there really is no need to be looking at the QX9650 unless you absolutely must have the best, or you're an overclocker who needs that unlocked multi to squeeze every last MHZ out of the chip. • Cooler and more energy efficient. • Software is still way behind unleashing the full potential of this chip. • The price...and the fact that I want one! Planning on splashing out on this or any of Intel's latest 45nm chips? Let us know in the forums.